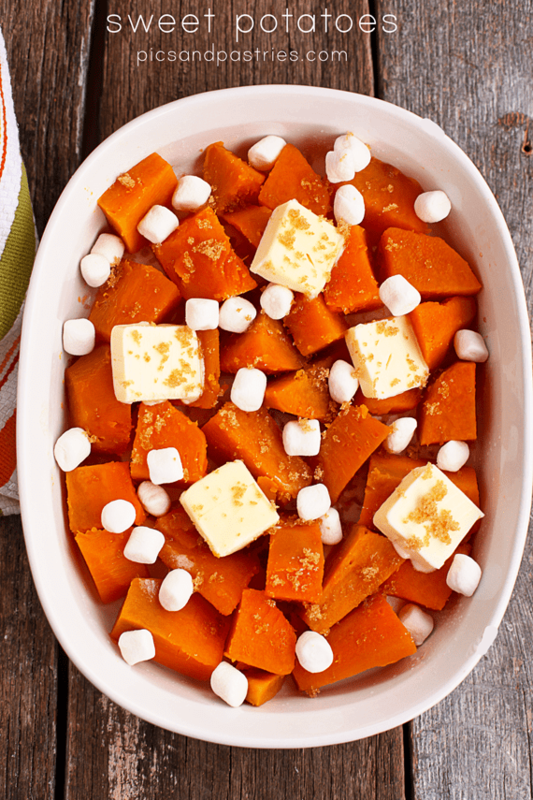 Sweet Potatoes– Diced sweet potatoes sprinkled with sugar, brown sugar, butter, and loaded with miniature marshmallows. One week from today we will be stuffing ourselves with turkey, mashed potatoes, stuffing and I will especially be enjoying these yummy sweet potatoes. I never had sweet potato casserole until a few years ago and I think it’s delicious Buuuttttttt, my family never fixed it and I grew up eating sweet potatoes prepared the way I am sharing with you. My husband know loves sweet potatoes, but wouldn’t touch them when we first started dating. Please note that in this recipe I use a little bit of orange juice. I have even used pineapple juice which is great, too. If you don’t have either one of those juices then just omit it from the recipe. I always scoop out the area of the dish that has the most marshmallows. I really love marshmallows! Dice potatoes and place in a pot with plenty of room for the potatoes to cook. Add enough water to cover the potatoes plus about an additional inch. Bring potatoes to a boil and allow to boil for about 10 minutes. Check for tenderness with a fork. Don't overcook because potatoes will bake in the oven for a few minutes. Sprinkle marshmallows over the top. Bake in a 375 degree oven for about 10 minutes or until marshmallows are golden brown and start to melt. Cover with foil until ready to eat. If the potatoes need to be sweeter just sprinkle more granulated sugar over the top until the desired sweetness level is reached. Feel free to add more marshmallows.